(1) Costa, P.; Trosien, I.; Fernandez-Oliva, M.; Sanchez-Garcia, E.; Sander, W. "The Fluorenyl Cation," Angew. Chem. Int. Ed. 2015, 54, 2656-2660, DOI: 10.1002/anie.201411234. 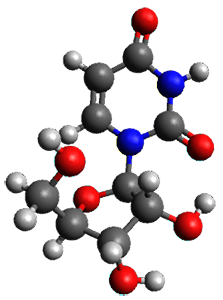 Uridine is sensitive to temperature, and so the laser-ablation method long used by the Alonso group is ideal for examining uridine. The microwave spectrum is quite complicated due to the presence of many photofragments. 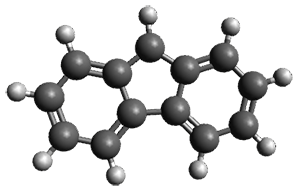 Careful analysis lead to the identification of a number of lines and hyperfine structure that could be definitively assigned to uridine, leading to experimental values of the rotational constants and the diagonal elements of the 14N nuclear quadrupole coupling tensor for each nitrogen. These values are listed in Table 1. Table 1. Experimental and calculated rotational constants (MHz), quadrupole coupling constants (MHz) and relative energy (kcal mol-1). In order to assign a 3-D structure to these experimental values, they examined the PES of uridine with molecular mechanics and semi-empirical methods, before reoptimizing the structure of the lowest 5 energy structures at MP2/6-311++G(d,p). Then, comparison of the resulting rotational constants and 14N nuclear quadrupole coupling constants of these computed structures (see Table 1) led to identification of the lowest energy structure (anti/C2’-endo-g+, see Figure 1) in best agreement with the experiment. Once again, the Alonso group has demonstrated the value of the synergy between experiment and computation in structure identification. Figure 1. MP2/6-311++G(d,p) optimized structure of 1 (anti/C2’-endo-g+). 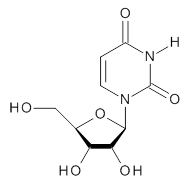 (1) Peña, I.; Cabezas, C.; Alonso, J. L. "The Nucleoside Uridine Isolated in the Gas Phase," Angew. Chem. Int. Ed. 2015, 54, 2991-2994, DOI: 10.1002/anie.201412460.